As women, we are all used to hearing casual judgement being passed off as advice in our day to day lives. From the overcrowded metro to the confines of our office space, we hear everyone talk about us in hushed tones, trying to hide the gossip and still hoping we would hear it somehow. From the contours of sexism that is interlaced within the layers of patriarchy in our society, emerges another disease that plagues the women of our country. From the length of our skirts to the cleavage being revealed from our shirts, women are constantly pushed in front of a badgering truck which is called internalised sexism. For those of you who are unaware of what this means, internalized sexism is actually the involuntary belief by girls and women that the lies, stereotypes and myths that surround girls and women and that are delivered to everyone in a sexist society are in fact TRUE! Kalki Koechlin is here again with a powerful message. 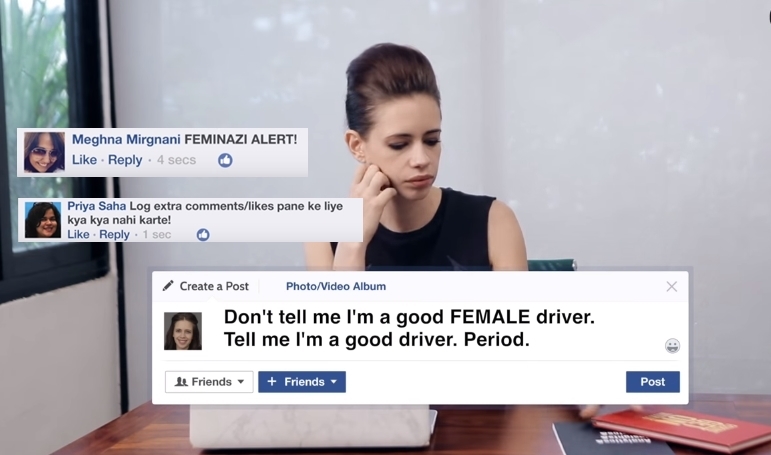 In a recent video posted by Miss Malini, Kalki speaks about how women push other women down and in the constant race to pull each other down, we are in fact encouraging internalised misogyny. The ninety-second long video actually urges each woman to ask herself, is she silently and subconsciously taking part in this. You are a tad too overweight, you should work on yourself right. 2. And the shaving blues. You will be judged! 4. And ofcourse the length of your skirt is going to bring comments on your character! 5. And finally the big question, when are you getting married? Since that is the be-all and end-all of all women on this planet. Kalki dones the role of 5 different women from our society who are equally responsible for the stereotypical nature in which women are asked to mellow down their tones, or make less risky choices, or focus lesser on their careers, etc. etc. So instead of looking for the ideal “Righteous Woman” and schooling the ones that have gone astray, ladies, you need to realise, it isn’t your job to decide what version of morality needs to be imposed on another woman. Instead of bringing each other down it is time that we build each other up!